Park Geunhye’s administration began with high expectations from the people. She is the first female president in Korean history, so she faced a great road ahead, but nearing the end of her time in office, her administration is the center of unprecedented scandal, connected to Choi Soonsil, the president’s dear friend. According to public survey results by Korea Gallup, 1,005 people aged 19 and over on November 1st through 3rd, President Park Geunhye's approval rating has plunged to just 5 percent, the lowest since taking office in 2013.1) It surveyed 1,005 Koreans over the age of 19 years old. This percentage is the lowest ever in the history of Korean president approval ratings. The survey also found that staunch supporters ― people in their 50s and 60s and people from the southeastern Yeongnam region ― have begun to turn their backs on President Park. Everyone in Korea is deeply embarrassed. With all the issues and suspicious dealings, citizens are calling for either an impeachment or the resignation of President Park, and everyone’s eyes are glued to the actions of Park’s performance from here on in. In response to the current uproar in Korea, Siguk-Seoneon unfolded across the country. That is, a political manifesto of opinions and objectives was formed by an organization of intellectuals including professors and religious personnel. People have voiced their concerns on social and political problems after recent revelations and urged the government to resolve them immediately. For instance, university professors conducted Siguk-Seonon citing Rhee Syngman’s fraudulent presidential election on April 25th, 1960. Immediately after it was brought to the public, Rhee Syngman, first president of Korea, stepped down. However, these days Siguk-Seonons are quite different from the past. Those are mainly centre on university students. 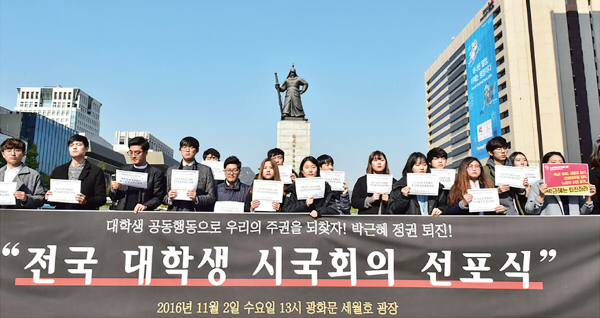 Students at Sogang University, President Park’s alma mater, and over 100 universities nationwide such as Yonsei University, Ewha Women’s University, and Sookmyung Women’s University, have joined in. I hope that it would be done peacefully, without casualties. It is both shameful and tragic at the same time. Our nation’s people are so convulsed. University students, our next leaders, must participate in political protests like Siguk-Seonon. President Park needs to step down as the nation’s leader to calm the disappointment and anger of the nation. Also, Prosecutors and the Board of Audit and Inspection should thoroughly investigate all allegations so that people are provided with the truth behind the suspicions.